To begin your professional career in diving, you'll need to attain the PADI Divemaster rating. After successfully completing Advanced Open Water and Rescue Diver training, you'll work closely with a PADI Instructor to expand your diving skills and knowledge to the professional level. 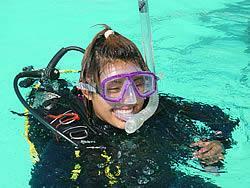 Then, in the most fulfilling part of your course, you'll learn and practice supervising diving activities and assisting with student training. Our Divemaster courses follow PADI's new DM course outlines. You'll also be completing the new PADI Divemaster exam including Physics, Physiology, Skills & Environment, Equipment and the RDP. The dive theory is usually the most common improvement area for IDC candidates. You'll receive valuable feedback on any missed question you may have. In the pool you'll practice the 24 skills from the IDC Skill Circuit and the Rescue Diver Course exercise #7 from the Instructor Examination (IE). We believe we offer one of the finest instructor training programs available today. Our IDC provides a professional learning experience in which you will learn how to teach diving while utilizing the most successful program in existence. Not only will you learn how to teach in the classroom, pool, and open water environments, you will also learn how to effectively use all of PADI's teaching aids and support materials. 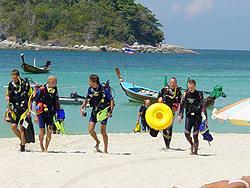 Dive Asia's Instructor Training program is intense, fun, demanding and exciting all at the same time. Candidates have fun, make new friends, and share rewarding life experiences while earning some of the most coveted credentials in the dive industry. 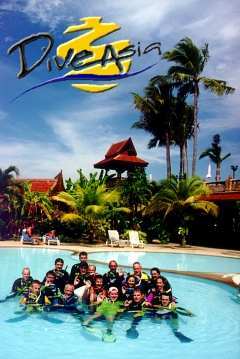 In Dive Asia's “Candidate Centered” IDC programs you will feel like a person - a member of a team - not just a number. The IDC begins with an assessment of your skills and Dive Theory Knowledge during the 2 Day prep course. When you complete the IDC, you will have been trained and prepared to successfully attend the PADI Instructor Examination (IE). This is the final step toward your Open Water Scuba Instructor certification. You will also be equipped with an excellent understanding of the diving industry, scuba course promotional techniques, progressive instructional methods and state of the art diving information. Daily lunch during IDC and EFRI at our poolside restaurant. Special menu for vegetarians. Free coffee, tea and fresh fruit. Complimentary Nitrox Instructor course or PADI's new Emergency Oxygen Provider Instructor course (materials and PADI fees not included). eRDP Multi Level, eLearning and PADI Air/Nitrox Digital Computer Simulator introduction. The only IDC program in the World to receive PADI's Hallmark of Excellence Award:" Outstanding Contribution to Instructor Development" for four consecutive years! Two days intensive IDC pre-study program with water skills- practice, dive theory pre-assessment and Rescue practice. Rental equipment available at a special low price during your IDC & IE. 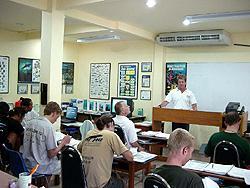 Your entire IDC program takes place at our purpose built all-in-one Career Development Center, in tropical Kata Beach. 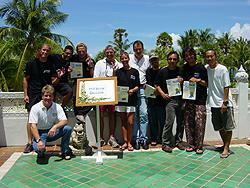 Dive Asia is Phuket's first PADI 5 Star CDC! PADI's new Care for Children program and AED training are included with your EFR Instructor course. Daily access to our 20 x 20 m swimming pool, throughout your pre-study and IDC, including tanks and weights for practice before or after the IDC pool sesions.. Extra in-water workshops - Buoyancy, CESA, Rescue, Knot Tying, Lift Bag use, Control, DSD, Ascents/Descents. Your IDC is conducted at Phuket's first PADI 5 Star Career Development Center (CDC), and includes our unique IE pass guarantee: We will invite you to do a second IDC with us for free, including in the very unlikely event that you don't pass the IE.Our pass guarantee includes any IE segment covered by PADI's IDC Curriculum. If you are already a diving educator from another recreational scuba certification agency, you can take advantage of dive industry demands by becoming a PADI Open Water Scuba Instructor. The PADI Crossover program (SSI/BSAC/CMAS Corresponding Levels with PADI) acknowledges that you're an experienced scuba instructor who only needs an orientation to the PADI system. This condensed course focuses on first analyzing and understanding the PADI system, and then adapting your instructional style to conduct PADI programs. The Crossover program consists of the five days OWSI program but we invite you to attend the full nine-day IDC Program at the reduced Crossover price. An evaluative program where you repeat what you have been doing during the IDC. After completion of the IDC or OWSI, you must successfully complete the PADI Instructor Examination (IE) to become an Open Water Scuba Instructor. You will be evaluated on dive theory, knowledge development presentations, confined-water (pool) teaching, open-water teaching, and general diving skills and professionalism. Nothing new. All our prior candidates found the IE easier than the IDC. Special CDC IE option: Candidates enrolled in five pre-and/or post-IDC courses (Pre-study, MFAI, Specialties etc.) OR candidates of a six-week career development program who successfully complete a PADI IDC conducted by Dive Asia CDC, may attend a PADI IE if they have been certified divers for at least six months, have logged only 60 dives and are certified PADI Assistant Instructors (the AI course is part of the new IDC). CDC candidates who successfully complete an IE and subsequently meet the 100-logged-dive requirements will be certified as PADI Instructors when their paperwork has been processed by PADI.